Q.U.B.E. 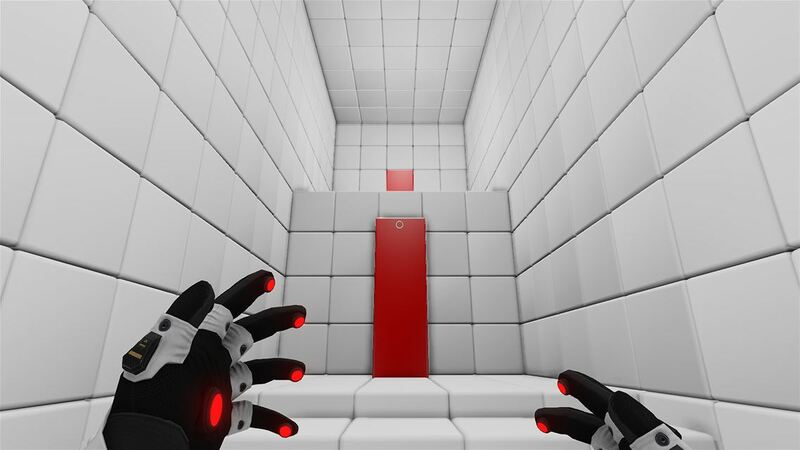 will immediately remind you of Portal with its gleaming test chambers and first-person-puzzle gameplay, but don’t be fooled into thinking it’s just another clone. Q.U.B.E. more than manages to stand out among the crowd with unique physics-based puzzles and an overall tone all of its own. It doesn’t match the humor – it doesn’t even try, actually – of Portal and goes for more stratightforward puzzle gameplay, which we can appreciate. Good thing, then, that the puzzles and overall gameplay in Q.U.B.E. are so good and make it worth playing on their own. See our full review for details. 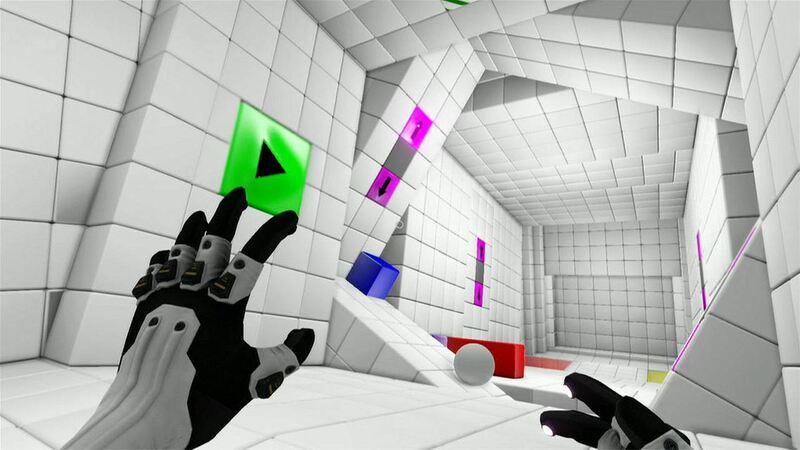 Originally released on PC a couple of years ago, Q.U.B.E. is available on Xbox One as a “Director’s Cut” version that adds new story elements and a time-based challenge mode. It costs $10 by itself but is also available in a couple of different bundles with other games. We kinda like the “GG Bundle 2015” for $15 that includes Q.U.B.E., Tower of Guns, Unmechanical: Extended, and Jet Car Stunts (3 out of 4 good games ain’t bad!). The story in Q.U.B.E. is about an astronaut sent to stop a mysterious alien cube that is hurtling towards Earth by solving puzzles. The astronaut has amnesia, though, so voices frequently reach out to him over the radio to try to remind him who he is so he doesn’t go nuts while exploring the labyrinthine cube. There are some twists and turns and surprises, but I found the story to be sort of superfluous. I didn’t need narrative motivation to keep pushing forward. I kept playing because it was fun. As mentioned above, Q.U.B.E. is a first-person-puzzle game. The alien craft you’re on is comprised entirely of cubes that move and shift right before your eyes. The game funnels you along through a series of closed test chambers where you have to solve a puzzle before moving on to the next chamber. That all likely sounds very familiar, but the puzzles themselves are very different from what you’ve seen before. The puzzles in Q.U.B.E. ask you to manipulate different colored cubes in order to make progress. The different colors correspond to what that cube can do. Red can be extended up to three times. Yellow blocks turn into three different lengths (the block you activate first is the longest). Blue blocks are jump pads. And green blocks can be moved around the room. You start out by simply using these different colored blocks to create a path to the next room, but the game starts throwing new things at you pretty quickly. There are physics puzzles where you have to get a ball through an obstacle course. Later those balls have to be turned specific colors by passing them through cubes that paint them different colors and dropped into the appropriately colored receptacle. Some rooms will let you rotate entire sections of them in order to move the cubes around to where you need them, and the ball puzzles might even require you to shift different sections of the room in a specific order to ensure the ball gets to the end. That isn’t even everything Q.U.B.E. throws at you, but you get the idea. The game does a fantastic job of gradually ramping up the complexity and difficulty of the puzzles to make sure it is interesting and satisfying all the way through. The puzzles are all easily solved through logic and critical thinking and shouldn’t stump you for too long if you just take the time to look around and think. It is all over a bit too quickly for my tastes, though. It only takes around 3-hours or less to beat the game unless you’re particularly slow at solving the puzzles. I suppose the original Portal was short too, but Q.U.B.E. really leaves you hungry for more. Better to quit while you’re ahead than by sticking around for too long, though. The presentation in Q.U.B.E. is very appealing because it is simple but still very good looking. 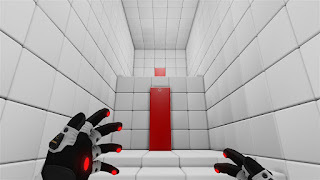 The test chambers are made of pure white cubes with the only color coming from the interactive cubes you use to solve puzzles. Similar to Portal, however, the sterile test chambers start to turn a little dingy and gray as you progress through the cube, which is cool. The sound is also well done with great subtle sound effects and music. Q.U.B.E. Director’s Cut ended up being quite a nice surprise for me. I fully expected another lame Portal wannabe, but it ended up being interesting all on its own thanks to the fresh and unique puzzles it offers. I also like how it presents the puzzles totally straight without humor or quirks or weirdness, which is another way it sets itself apart from Portal. Is it better than Portal? No. 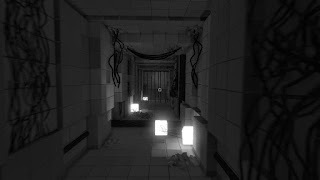 But it is still a very well done game overall that can stand right alongside Portal as some of the best the first-person-puzzle genre can offer. Definitely give Q.U.B.E. Director’s Cut a look.